The Standard: UN: Address Climate Change "Head On"
UN: Address Climate Change "Head On"
Secretary General Ban Ki-Moon opened a UN meeting in New York on Monday with a call for aggressive action to solve the problem of climate change. Moon urged more than 80 leaders to show the world they would "shoulder the responsibility" of reducing carbon emissions and combating warming trends. These trends are changing global weather patterns and threatening the infrastructure of human civilization. 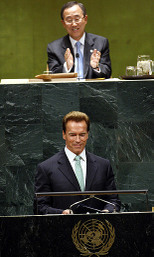 The governor of California, Arnold Schwarzenegger added later in the day: "...one responsibility we all have is action." The words come at a time when many nations are failing to make and meet commitments that address human causes of climate change in an effective way. The first international attempt to limit carbon emissions has largely been thwarted by the refusal of the US to sign on to the Kyoto Protocol. Many have also expressed frustration that the Kyoto agreement failed to place responsibility on China. In addition, it is expected that the UK will miss its target for cutting emissions in 2010 by more than half. Many leaders, including US President George W. Bush, have made the claim that a rapid response to combat global warming will entail increase costs that will harm national economies. Speaking to the Financial Times on Sunday, former US President Bill Clinton refuted this notion. He emphasized that new job markets created from investment in new energy-efficient technologies will help US economic growth. President Clinton made news in May when he structured a deal that saw major banks including Citi and JP Morgan provide financing for US cities to make buildings energy efficient at no net cost.